Community leaders and activists will gather at Courthouse Plaza tonight (June 1) at 6:30 p.m. to mark National Gun Violence Awareness Day and Wear Orange Weekend. Organized by Arlington members of Moms Demand Action for Gun Sense in America, the rally will feature speeches from local leaders and voter registration with Arlington NAACP volunteers. “I see rallies like this as an opportunity to raise awareness, to think about the daily violence that happens that doesn’t make the newspapers, but is something that impacts all of us,” Beth Fine, the local lead for Moms Demand Action, told ARLnow. 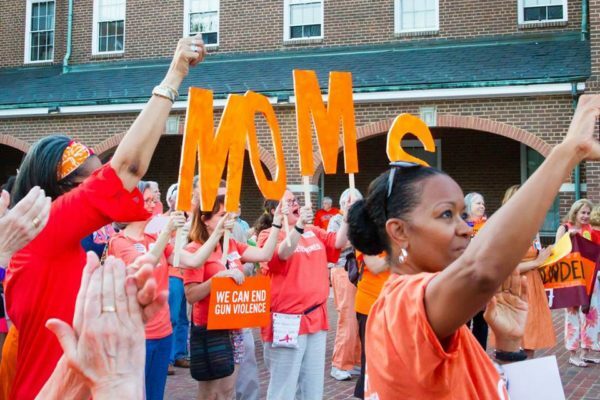 The event is one of 19 that will take place throughout the state this weekend, according to the Virginia Moms Demand Action Facebook page, and is among more than 350 planned across the country. Arlington County Board Vice Chair Christian Dorsey and School Board Chair Barbara Kanninen will both speak at the rally alongside Arlington Poet Laureate Katherine Young and student activists Karina de Leede and Chloe Fugle. “I will be speaking about the School Board’s support for Wear Orange, our concern for the safety of our students and staff and the importance of student voices,” Kanninen said. The Wear Orange movement began in 2013 when friends of 15-year-old Hadiya Pendleton wore the color after Pendleton was shot and killed. Everytown for Gun Safety, a national organization that advocates against gun violence, began promoting the campaign nationally in 2015. “It’s important too that they know we are out there supporting people who are on board with this message,” she added. Over 200 businesses in the Arlington area will also post fliers or offer specials to customers wearing orange this weekend, according to organizers. Alto Fumo, Ambar, Busboys & Poets, Cafe Pizzaiolo and New District Brewing Company are among the local businesses expected to run Wear Orange promotions this weekend. Ultimately, Fine said community members who attend the rally should feel empowered to make change.